One Handed White Leather Wizard Sword | BUDK.com - Knives & Swords At The Lowest Prices! Release the magic with this One Handed Wizard sword! The stainless steel blade is mirror polished and the handle features a white leather wrap. The included wood scabbard also features a white leather cover. To Start, I PREFER stainless steel in my fantasy swords. Stainless will last 500 or even 1000 years with just a little care, long after ordinary steel has rusted into red dust. This blade seems strong and slightly flexible. Just a pity the handle and guard are not stainless also. I would like the idea of a thousand year sword. This is a nice sword, and displays very well, though to call a 10 inch handle "one-handed" seems almost as silly as Bud K calling their basket hilted Scottish sword "two handed" (only a child under 10 could possibly get 2 hands into the Scottish basket to hold the grip). But I digress. This Wizard sword is quite a bit shorter than I had hoped, measuring 37 5/8 inches long with a mere 27 1/2 inch blade and a 10 1/8 inch handle. Only IN the scabbard does it measure the promised 42 inches. I never heard of a scabbard included in the length of a sword before. About the handle: I think the cream/white color, oddly loose covering on the handle is real leather, as promised, and put over nicely ridged wood which you can't see because the leather is loose, almost baggy. The leather is thin and glove soft, from some small thin skinned animal and I dare not think what small Chinese animal it came from. If they had spiraled the wood of the handle, instead of making ring shaped ridges, they could have added a spiral of wire outside to hold the leather tight against the wood, as they do in many other swords. Sadly they left it loose. (Do you remember that hot date when you grabbed XL condoms at the pharmacy by mistake?) Anyway, loose or not, it still looks fine. The nice and tight pure bright white scabbard covering is obviously pleather (plastic leather) and it is stitched up one side so you can see the edges with a magnifier for positive identification. All edges on the handle are cleverly hidden by having the seems rolled inwards, or covered by sword parts so I can't be sure, but the handle feels and smells like leather, and is off white like white leather often is. 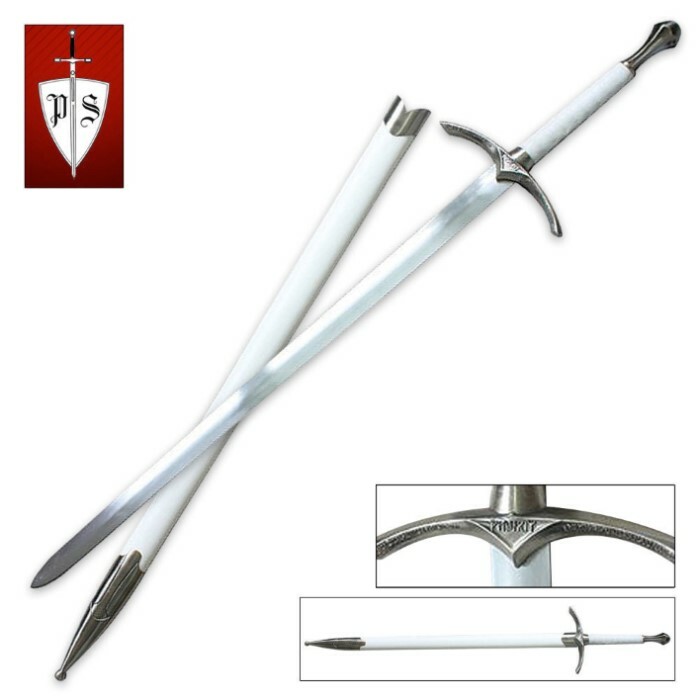 And it is very different from the scabbard covering, which is white and tight (Do you remember the hot date when you grabbed the X Sm...oh never mind....) All the sword furniture seems to be a non-magnetic pot metal, typical of inexpensive swords. It looks nice, with a fake antique patina. The slightly lenticular cross section blade is a respectable 4mm thick, and polished into what I might called "semi-gloss" like your stainless trash can or refrigerator. It will reflect your finger if you lay it across the blade. Not quite "mirror polished" as promised, but very nice. It is very faintly marked "CHINA" but nothing else, not "Stainless" as most Bud K stainless blades are. That worries me a little bit. I would hate to have this rust away in 500 years. The blade has a nice even edge, but this sword really cannot be considered sharp. The angle at which it is sharpened is more like 40 degrees, like your axe, not like your kitchen knives which are probably sharpened at 15 to 20 degrees. With a lot of time with a file or a short time with the proper power equipment, I am sure it would take a great edge. It has a good point, and easily ran through the shipping box with a very satisfying noise. I suggest you take it off your couch before you try this. The blade is stable in the handle, but the guard is a little loose and rattles and wiggles if you shake it. I am sure I could fix it with a drop of epoxy if I cared to. Overall it really is a good sword for the price. It's a great price but the fact it's made with stainless steel and not carbon steel is a deal breaker as Stainless steel is great for display pieces but is to stiff for real battle ready blades. This sword looks cool. I would totally buy it if it were carbon steel.